When Kiera gets a phone call from a person with a disguised voice claiming to have her twin brother Kevin held hostage she rushes to Kevin's house to find him. It turns out Kevin has disappeared and his work is claiming that he has stolen a biotoxin that he was working on. Blackwell Tactical has been hired to find Kevin. Cooper Ashcroft is on the job when Kiera is almost run over by an ATV. Rescuing her and taking her to their training compound does not mean that they trust Kiera to not be involved in the theft of the biotoxin. Determined to prove both she and her brother's innocence Kiera insists on helping the team play the kidnappers game to free her brother. What neither Coop or Kiera count on is their attraction to each other. But neither one of them have a relationship written in their life-plans, especially with someone they cannot believe or trust. I'm definitely a fan of the Cold Harbor series. 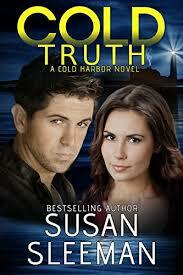 The suspense of Cold Truth is what I expect from Susan Sleeman's books. It keeps the reader on the edge of their seat and keeps them turning the pages late into the night. Kiera was a strong female character, at times bordering on hysterical. I can't imagine having your twin in such danger so would assume that a person would fall apart at times. She pulled herself together with the help of Coop and continued head on into danger. Both Coop and Kiera struggled with their faith in God. I always like the spiritual aspects of Susan Sleeman's books because they show everyday people struggling with honest feelings about God's role in their lives. The Cold Harbor series is definitely one that I recommend if you enjoy suspense and a bit of romance. Thank you for such a lovely review, Julie. You rock! This is another one of Susan's fantastic books filled with unexpected twists & turns with a unique plot. I truly enjoyed it! Thanks for stopping by Lora. I love all of Susan's books as they are all filled with suspense that makes me bite my nails!